These tacos are filling and were created based on a visit I took to Tennessee Taco Company here in Memphis. At this place, I ate one taco with cauliflower in it and another that had walnuts in it. So delicious and so different. 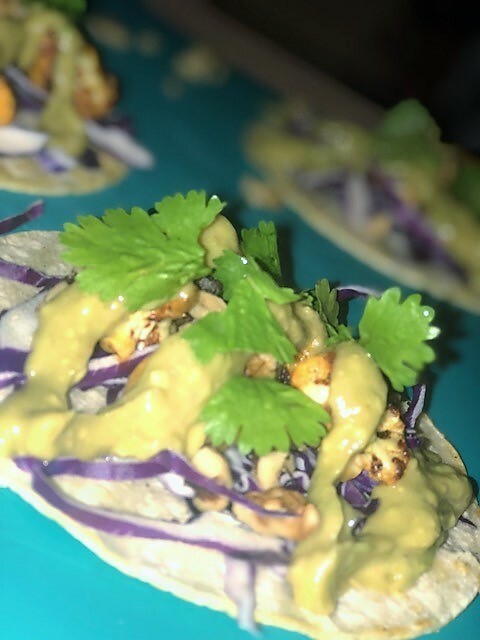 I decided to use cauliflower and walnuts in one taco (strange, I know), but it turned out really well! These tacos also happen to be vegan, if that’s your thing. Let me know what you think! Remove florets from cauliflower and rinse thoroughly. In small bag, combine paprika, turmeric, ginger, cumin and salt/pepper. Add cauliflower to bag and shake to coat. Heat oil over medium heat. Add cauliflower and cook until browned and a fork easily pierces it. Add a little water if needed. Set aside. Combine avocado, chili paste and honey. Build tacos starting with shredded cabbage, then cauliflower, walnuts, avocado sauce. Top with cilantro and serve.